European Pensions //iorp.eu: Seven faces of "The Peril"
What sounds like an Asian action flick is in fact an important research paper (server down, but here's the exec summary) by James Bullard of the St. Louis Fed which has caught the markets' attention last week. 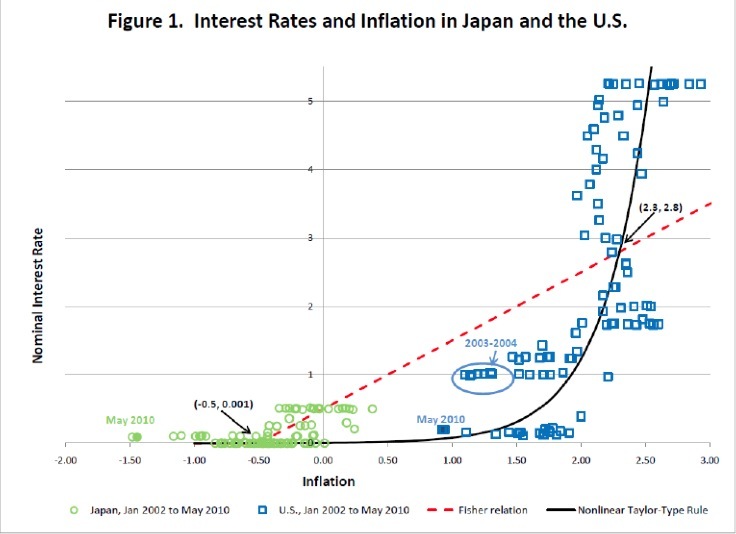 The attention is well deserved as the paper demonstrates how current monetary policy concepts and postures might lead the world's largest economy(US) to join its second largest (Japan, for now) in a steady state equilibrium of very low interest rate / inflation. This second intersection point of the Fisher relation with the non-linear Taylor rule is a most undesirable place to be in, of course, because monetary policy is entirely ineffective there, but Mr. Bullard shows convincingly how we might end up there all the same. His proposed way out is quantitative easing (QE II) rather than the current monetary stance. This leaves the Fed with uncomfortable short term choices: either stick to the current extended period (of very low interest rates) language with its associated Japan scenario, or start Mr. Bernanke's helicopters once more. Neither will be much appreciated.